CREATING HEALTH Lecture #2: Understanding Metabolism — GOOD GIRL GO GO GO! 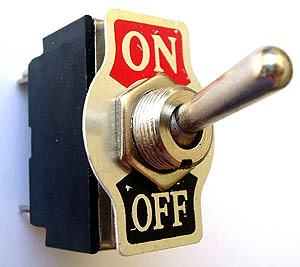 How did the fat switch get turned on? and why isn't it turning off? This week's Creating Health lecture focuses on Metabolism, Insulin Resistance and Metabolic Syndrome. The learning objectives of the lecture will be to examine the drivers of Weight Gain, Insulin Resistance and Metabolic Syndrome; the relationship between macro-nutrient content, lipogenesis [the biologic imperative to store fat] and leptin-insulin resistance; and the relationship between Biology and Behavior. Four essential clinical pearls will emerge from tonight's lecture. Take note! Calorie restriction decreases metabolic rate, enhances hunger and reduces the drive to move. "Eat less-do more" is not a successful or sustainable strategy. Different macro-nutrients produce different effects in thermogenesis, hormone regulation, and satiety. 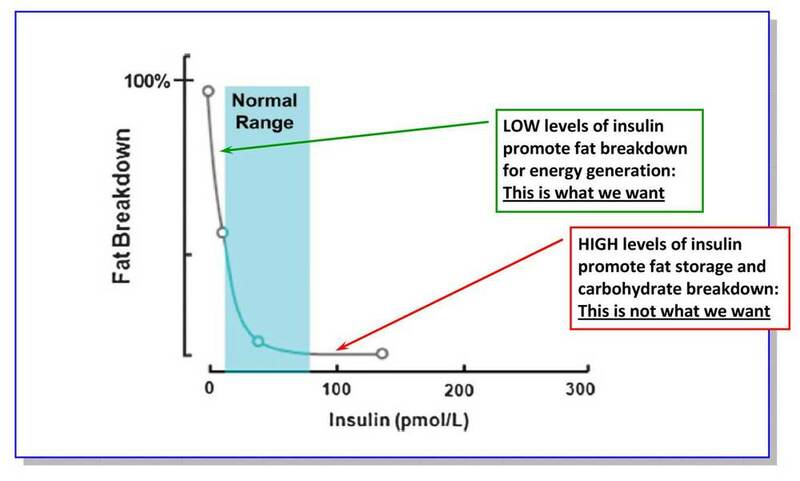 The biologic goal is to reduce leptin and insulin resistance. 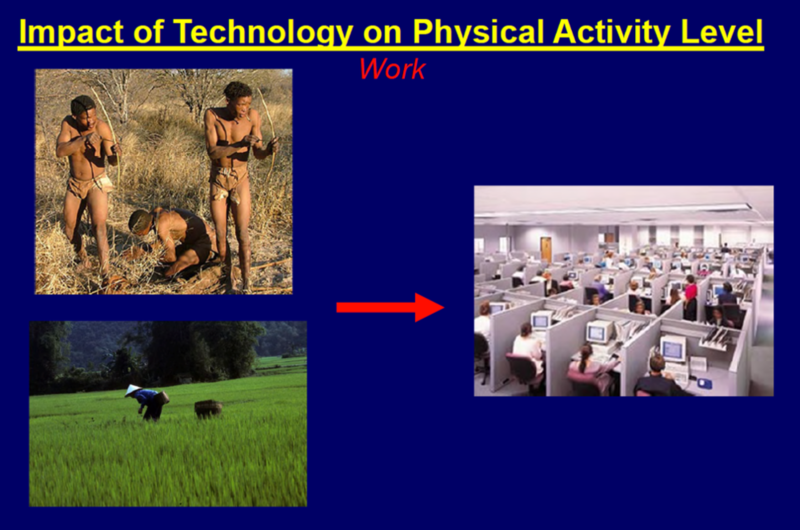 Last week I showed the image of "McPaleo Man" to illustrate "Health as a byproduct of gene-environment compatibility." 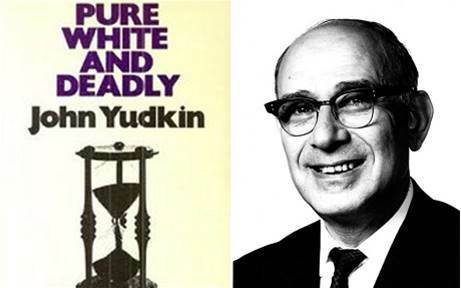 There is a growing incompatibility between ancestral gene programming and modern 21st century lifestyle. Healthy living happens in the healthy choices we make that align our modern life with our genes. Just because we are genetically pre-disposed to a condition does not mean we are prisoners of our genes. How does a Functional-Systems Biology Model differ from the way we are currently looking at our health?Instead of looking at "the leaves" of disease to determine treatment, Functional Biology turns the model on its head and shifts analysis to begin at the roots, to find the root causes. 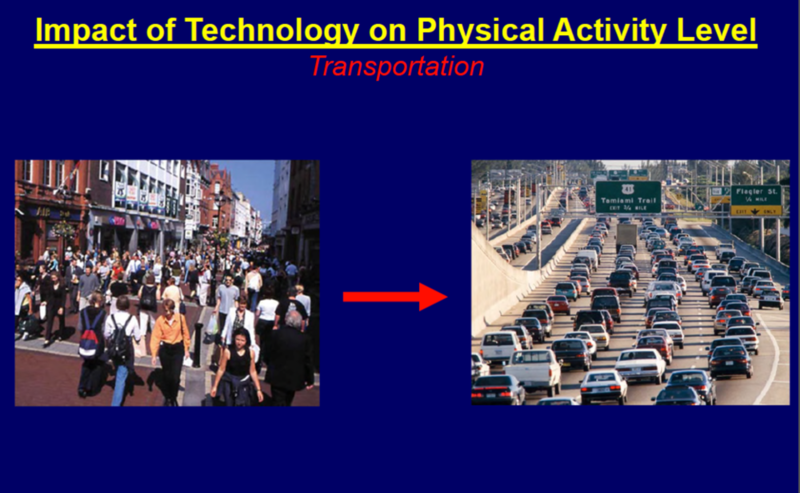 Once we discover the root causes we can change our biology by changing our behavior. Our DNA is more malleable than we think: we are NOT locked in to our genetic legacy. We consume more calories than we ever did before and they are not quality calories. 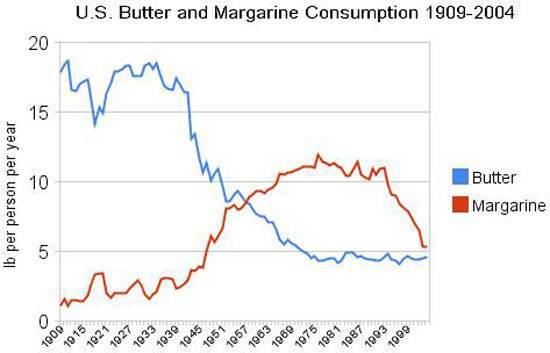 Don't blame butter for obesity. 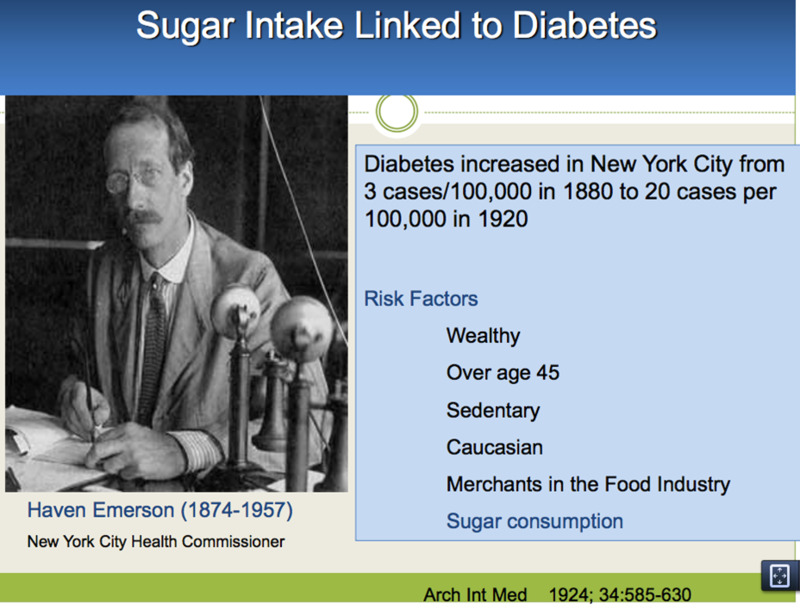 Crisco oil replaced butter, lard and tallow, thanks in part to Ancel Keys' research [see below]. Proctor & Gamble's Crisco was the leading sponsor of the American Heart Association campaign to reduce fat. Studies later revealed substituting polyunsaturated vegetable oils for saturated fats increased cardiovascular risks and deaths from all causes. The pendulum is starting to swing towards how certain foods we eat interfere with our biology, producing excess Insulin and Leptin. There is no obesity gene. There is no diabetes gene. 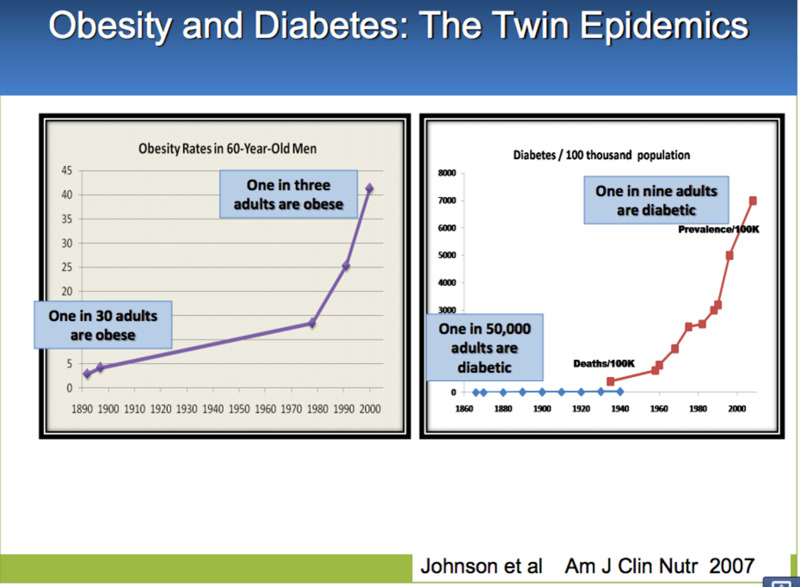 The growing public health problem of obesity and diabetes is not driven by genes. The quality of the food we choose to eat impacts our weight. Food composition affects metabolism. in the microbiome [drivers of hunger have little to do with calorie counting]. The National Health and Nutrition Examination Survey (NHANES) 2003-2006, studied more than 3400 adults over age 20 and discovered the overall prevalence of Metabolic Syndrome in 34% of those studied. Metabolic Syndrome increased with advancing age and weight and there is a higher prevalence of Metabolic Syndrome in Black and Mexican American females. NAFLD [Non-Alcoholic Fatty Liver Disease] was not described until 1980 and has grown to become one of the most common diseases in America present in 45% of all Latinos; 33% of all Caucasians; and 25% of all African Americans. 5% of total cases progress to NASH [Non-alcoholic SteatoHepatitis, liver inflammation and damage caused by a buildup of fat in the liver]. 25% of NASH cases progress to Cirrhosis [chronic liver damage leading to liver failure]. NAFLAD is 100% preventable. Among adults with type 2 diabetes, there was an estimated 1.6-fold increased prevalence for cancers of all sites among men and a 1.8-fold increase among women who reported being diagnosed with diabetes 15 or more years ago compared with those reporting diabetes diagnosis less than 15 years ago. Diabetes Care Jan 2013. For breast cancer, 1.5–2.4 risk comparing women with highest levels of insulin to normal levels. Journal of the National Cancer Institute. Consuming fructose-sweetened, not glucose-sweetened beverages increases visceral adiposity and lipids and decreases insulin sensitivity in overweight/obese humans. "Fasting plasma glucose and insulin levels increased and insulin sensitivity decreased in subjects consuming fructose but not in those consuming glucose." Ian Spreadbury points to the single greatest difference between ancestral and modern life: acellular carbohydrates. Wheat just ain't what it used to be. Carbohydrate density isn't the lightest subject, but the grid below illustrates the carbohydrate choices we make. Stay away from those Rice Cakes! Leptin is the appetite hormone. Many obese people appear to become resistant to Leptin. A healthy Leptin function signals satiety in the brain [hypothalamus] and promotes a “readiness” to move. 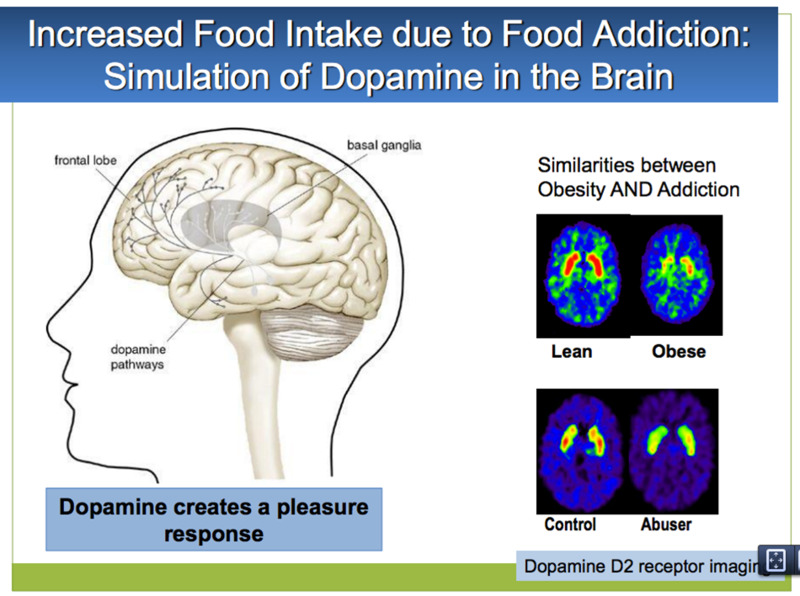 Disrupted Leptin signalling causes Leptin Resistance which leads to weight gain, hard-to-control hunger, and a deep desire to minimize activity. Inflammation is associated with Insulin Resistance. 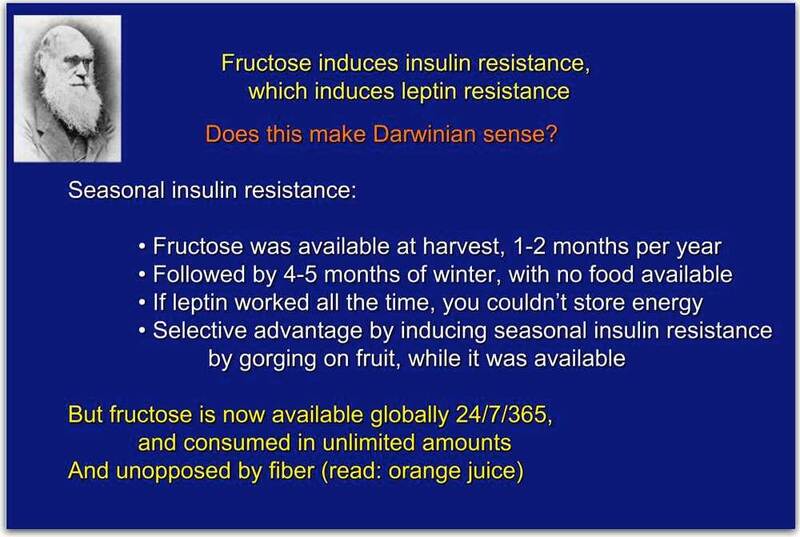 Insulin Resistance is associated with Leptin Resistance. 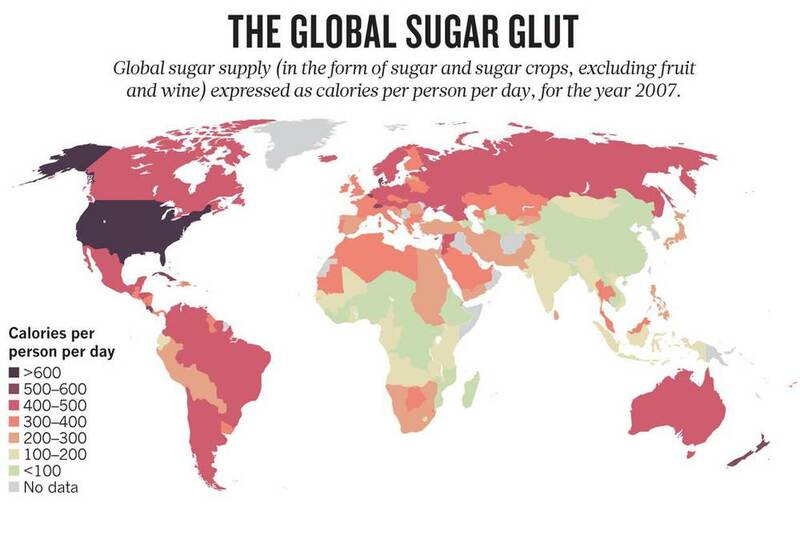 Fructose wasn't always available everywhere in the world 24/7. It was only available at harvest and was necessary "survival" trigger to induce Insulation Resistance in order to store fat through the winter. 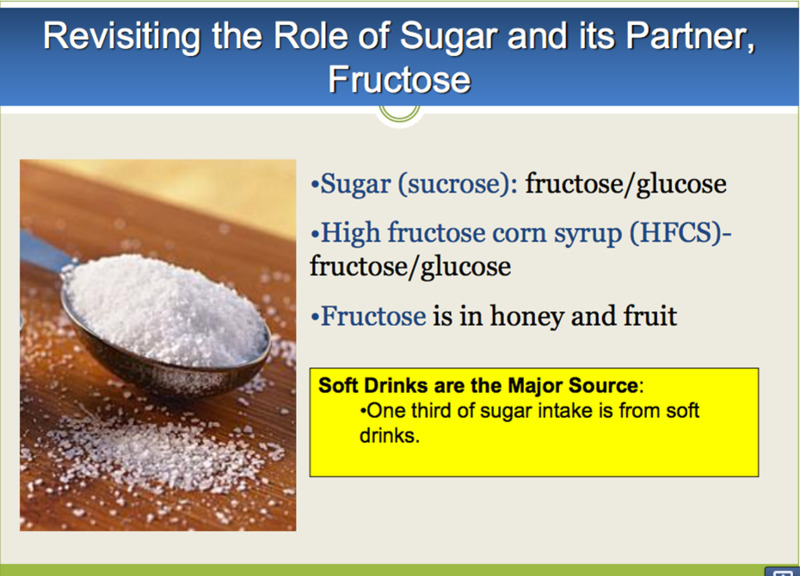 Fructose stimulates weight gain. We have evolved to be rewarded for caloric-dense sugary fat foods as part of survival, an adaptation challenged in modern times. High-Glycemic Carbs [macronutrients]: Dozens of genes switched ON as 62 genes regulate increased inflammation, stress, and immune responses. 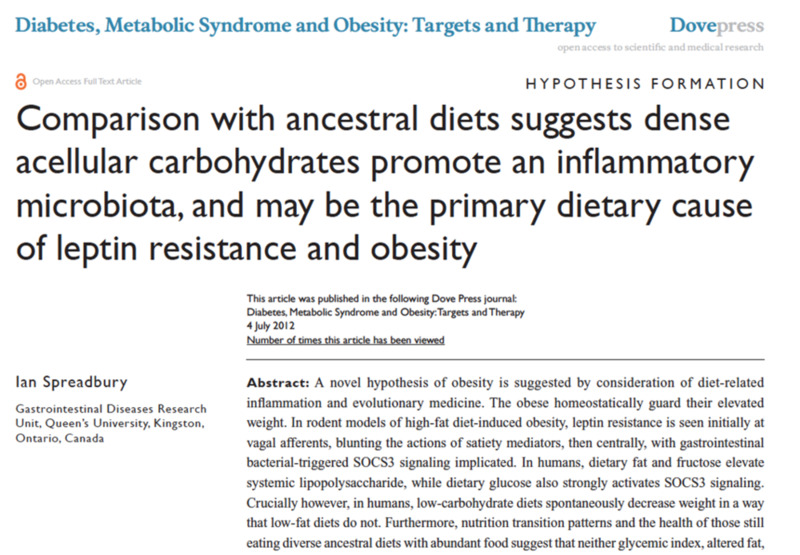 Switch to Low-Glycemic Carbs [beans, legumes]: Same genes are silenced. Genes regulating insulin production are switched OFF. The microbiome has evolved with humans to allow survival. 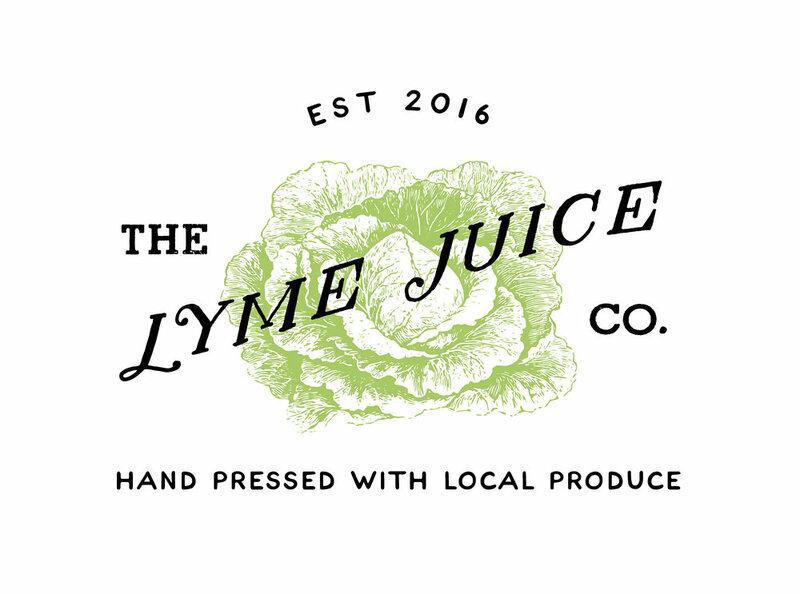 It provides important functions in digestion, immunity, metabolism and detoxification. These "bugs" have allowed us to survive. From a cellular perspective, our body is 10% human and 90% microbial. The gut microbiome in each person contains 100-150 times as many genes as the human gene pool and over 99% of the genetic diversity in our bodies is due to microbial colonization. Gut microbes can drive appetite. 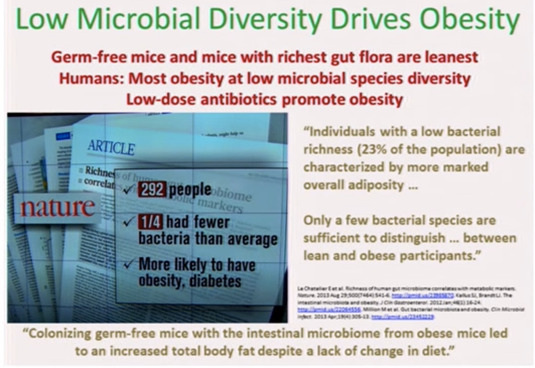 Low Microbial Diversity in the gut drives obesity. Colonizing germ-free mice with the intestinal microbiome from obese mice led to an increased total body fat despite lack of change to diet. 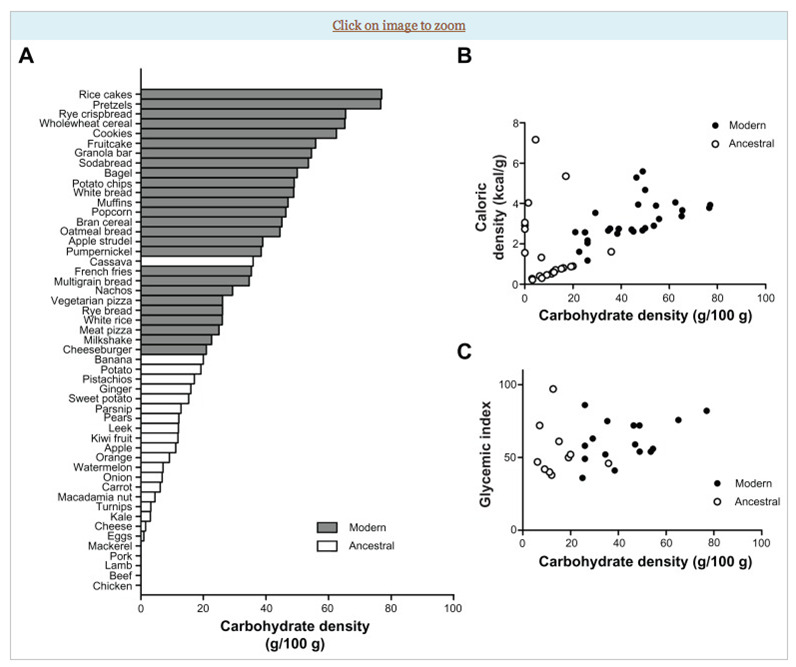 Increased carbohydrates [CHO] digesting microbiome in populations with higher CHO intake. Reduced microbiome diversity is seen in obesity, IBD, autism spectrum. Diet is a powerful factor that can shift the gut microbiome. 70% of the immune system is located in the gut epithelium. 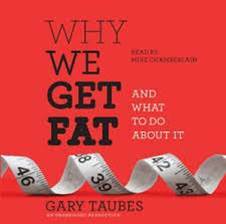 Now that we've explored why we get fat, how can we get "Un-Fat"? Move More - Motion is the Lotion! Sleep. 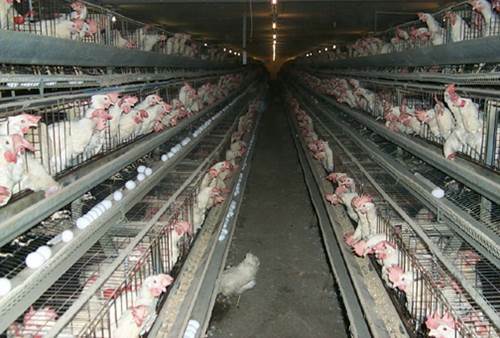 It's not a luxury. It's a Necessity. 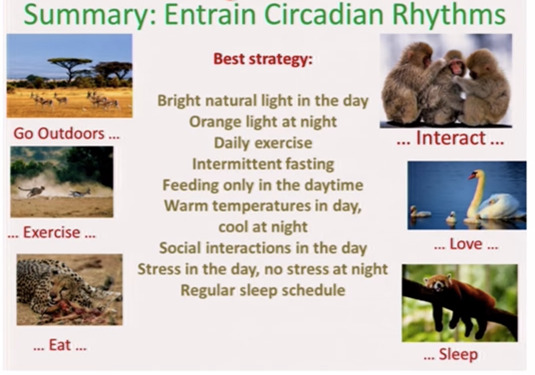 Zeitgebers "Time Givers" are external cues that drive circadian rhythms. Light, ambient temperatures, social interactions, exercise and meal timing are all known "Time Givers"
For more "news to use" and the science to go with it, visit my website The Health Edge: Translating the Science of Self-Care. To download complete lectures follow this link to BHS Creating Health Wellness Series.